The design for Vienna’s Loos Haus is 100 years old. The what, you ask! 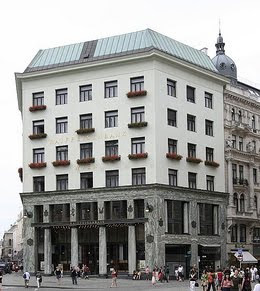 The Loos Haus is a building in central Vienna designed by the modernist architect Adolf Loos (1870-1933). It is regarded as one of the most important buildings in twentieth-century architectural history. The so-called Loos Haus was commissioned in 1909 by the prominent Viennese company Goldman und Salatsch. The building Loos designed can still be seen today and looks as strict as ever amongst the nineteenth buildings and directly behind the old imperial palace. As building began in 1910 the Viennese and their emperor were so shocked by the bare external walls that the City Council ordered a stop to work. Construction eventually resumed when Loos agreed to the inclusion of window boxes. But the old Emperor Franz Joseph never liked the building. Little did he know that within ten years of the Loos' building being finished World War I would blow apart the Austrian Empire, drive the royal family into exile and usher in a world of architecture that owed a great debt to Adolf Loos.